Absolutely loved this place! Especially the people that worked her. They were so kind and spoke really good English! They did a really big favor for me and helped me out with all the sightseeing options in Taipei. The beds were nice, clean and the breakfast was delicious! Much love from Amsterdam! Just perfect! We loved it! Meander is one of the best hostels I've ever stayed in. The place is cleaner than my own appartment. 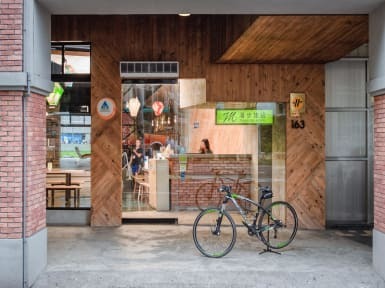 Great atmosphere, so perfect to meet people to travel the rest of Taiwan with. Claire is a better 'Elephant Hill' tourguide than you can imagine. I'm going back for the third time next week, see you there! Cant say anything bad about it Just great hostel thanks too all the staff who is working there! Had a great time in Meander hostel. It's a bit more expensive than others in Taipei but it's so worth it! Lovely staff, perfect cleanness and nice activities arranged by the hostel! Especially enjoyed the elephant mountain sunset hike with lovely Pei! Also all my credits for lovely Sunny! Loved this hostel! Central location in ximen. Real friendly staff, and easy to meet other travellers. They also organise and suggest some activities in taipei. When I was there i joined the hotpot night, which was great. Jep, I totally loved my stay here from start till finish. Great (free) daytrips, enthusiastic staff, clean rooms and bathrooms, easy to find and well located. Breakfast is better than in many other hostels (read: more than just toast). Can't wait to come back soon. Top hostel, fijne sfeer en fijn personeel. Aanrader. Als we toch een minpuntje moeten bedenken: het ontbijt is voldoende maar geen uitblinker (zeker het gemis van zwarte koffie). Topper is het personeel en de enorme gezamenlijke ruimte die het hostel biedt. Wij komen zeker terug! I really liked this hostel. the rooms were nice, the atmosphere was really cool and the staff is really friendly. Very friendly and helpful staff. All facilities are relatively new and clean. The lockers in the rooms are quite small, they barely fit a laptop. 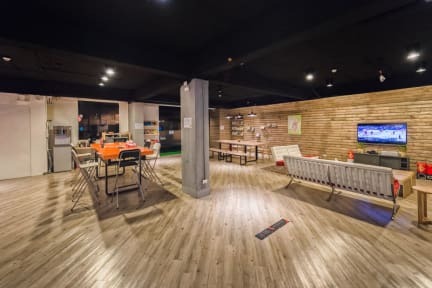 Not much was going on in the common area downstairs, so social contract in the hostel strongly depends on the people you share a dorm room with. The surroundings of the hostel are okay. Quite some Chinese-style restaurants, a metro station and many stores are within a reasonable walking distance.